Fernanda Solórzano is the chief film critic for Letras libres. She has also written for many Mexican print outlets, as well as Cahiers du cinéma, Caimán cuadernos de cine, and Sight & Sound, among other foreign publications. She is currently working on a dictionary of Mexican film production. 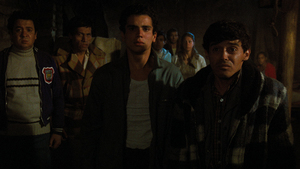 Religious fanaticism and anti-Communist hysteria give way to mass violence in this groundbreaking work of Mexican political cinema.